Today, the News Tribune joins 92 percent of Tacomans, neighborhood councils, and weighs in heavily against the ill conceived billboard "deal" which would insert 24/7 commercial spam machines into the City of Tacoma. Do the math: Clear Channel stands to make a heap of money for agreeing to give up its fight against a law that, if enforced, would nearly run the company out of town. Thats compromise all right of Tacomans hopes for a city with less visual blight. Its no surprise that neighborhood councils have taken a dim view of the settlement, as have members of the citys planning commission. The city also doesnt need a moratorium to do what it should have done from the start: Negotiate with Clear Channel from a position of strength. Clear Channel may have the bigger war chest, but its business is outdoor advertising, not employing lawyers. It needs a settlement more than it needs a protracted court battle. If the City Council thinks a moratorium will signal to Clear Channel that Tacoma plans to finally play its hand, then by all means. Better yet, skip the nuance and just tell the company: The deal is off; lets renegotiate. If you do not want Tacoma to become a commercial spam city blighted with digital and other billboards come to the City Council meeting on May 17, 2011 at 5:00 pm. A large turnout is important to support the City Council on taking a fresh look at billboards in Tacoma. The City Council will take public comments at the beginning of the meeting and vote on May 17th on immediately suspending applications for any kind of new billboards, digital or static. The proposed moratorium can be read here. The City Council allows up to 5 minutes for oral comments - or bring written comments to submit. A show of force is important! Our show of force before the Planning Commission got us here. For more information on the Tacoma billboard issue, see the Central Neighborhood Council website here. Breaking: According to the legal analysis of Doug Shafer, it appears the 1997 Billboard Law was legal and dependable in court all along and there was no reason for City of Tacoma to capitulate on the issue. "How Did This Digital Billboard Sneak In?" by fredo on 5/15/2011 @ 8:19am The moritorium benefits CC more than it does the city. The CC game plan is to drag out the legal process as long as possible, even for months or years all the while collecting rents on the boards. They use a variety of methods for dragging out the process, stalling, violating the law, filing suits, proposing moritoriums, etc. The net result is the same, we're stuck with the CC billboards. The moritorium will make it even harder for concerned Tacomans to keep the focus on enforcement of the 1997 billboard ordinance. Tacomans have already spoken, they don't want any billboards. There's no need for any further foot dragging. Time to drop the moritorium proposal, turn down the settlement offer and proceed to a court determination. In court there's a chance we will prevail. If we throw in the towel we have zero chance of winning. by L.S.Erhardt on 5/15/2011 @ 8:33am Damn it! Why Tuesday? Why does the city always hold these meetings on days I work? Is anyone going who would be willing to submit my comments in writing for me since I can't make it? by Erik on 5/15/2011 @ 9:04am @Thorax : You can always email your comments in. @Fredo: The 1997 Billboard Law is the current law of the land in Tacoma and is generally very good. It was developed after significant public input. Thus, the status quo benefits Tacomans. We don't want the electronic billboard settlement/capitulation imposed on the city that the Tacoma City Council was considering. Thus, any delay is good especially since a lot of people are working on gathering signatures in opposition. 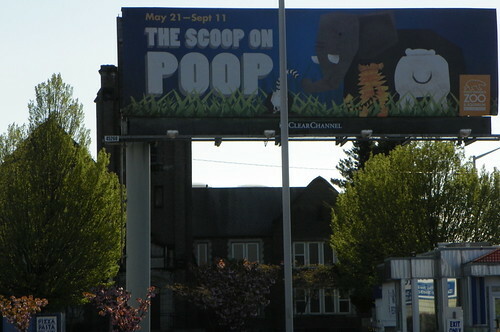 by fredo on 5/15/2011 @ 9:42am The billboard "law" is like the leash "law" and lots of other unenforced laws in the Tacoma City Code. These laws all sound great but in fact there is no proceedure or public will to reign in particular behaviors or conditions. I am curious about this "petition" that you allude to. What petition? I've been reading these discussions for a long time and I don't remember hearing about any petition. Any way, if you can drop one off for me I'm sure I can get it filled up. I'll do my part. thanks erik. by NineInchNachos on 5/15/2011 @ 1:21pm the moratorium is a sneaky way to rack up more fines on the fine counter. What would it be by then.. a billion dollars in fines? by NineInchNachos on 5/15/2011 @ 1:22pm the fine counter doesn't even consider interest on the fine! But I'd like each of the 9 council members and each of the declared city council candidates to make a statement about what they intend to do about the very significant fines that Clear Channel owes the city. 1. What will be the estimated cost to defend the 1997 billboard law as it stands? 2. Can the city afford defending the 1997 law in court even if they're likely to win? 3. How evil exactly is Clear Channel? 4. If we deal with this devil, will they abide by the agreement? 5. Given that Clear Channel makes six times more money on digital billboards, what type of settlement is possible? 6. Taking into consideration the X-factor of digital billboards - there's no guys needed to go out and change the message thus making the digital billboards that much more profitable. 7. What are the future permits Clear Channel holds worth if anything at all? 9. With revenue spent on defending billboard law, what is the future value of that money in terms of opportunity cost? 10. Is it economically feasible to just start taking them down (because they're illegal) and worrying about the lawsuits later? The higher X, the more likely the lawsuit. 21.8 digital billboards is "fair" according to CC. Anything less is a lawsuit. Anything more is a give-away. 38 total is a huge give-away. The equation above is just me having some nerd fun. I think they should fight the damned thing. It's the right thing to do. by fredo on 5/15/2011 @ 4:32pm RE: the costs of defending our billboard law. Nice outline Jesse. I'm no attorney but I believe that Clear Channel has the burden of proof in this case. In other words they will have to convince a judge that the Tacoma law should not govern their behavior. Our job is to make sure our defense team is well groomed, polite and thoroughly knowledgeable about all case law which is likely to be presented. We must distinguish those cases which tend to support Clear Channel and present those cases which tend to support the city of Tacoma. There will be some costs involved but any city which can spend a million dollars putting together a tinkertoy pagoda shouldn't have any trouble putting together an adequate defense. Win or lose the whole thing will be over after a few days in court. If we are going to make laws governing the behavior of businesses in Tacoma then we are going to have to be prepared to defend these laws, that's the business of running an actual city. Too bad if turns out a bit more expensive then we would hope. by jenyum on 5/15/2011 @ 7:34pm Good that you pointed out the potential value of a digital billboard, Jesse. Keep in mind that once permitted and built Clear Channel will acquire property rights to said billboards, making any further attempts to regulate them a huge, expensive PIA much like the huge expensive PIA we are facing now but potentially much worse, given their expanded income potential. by NineInchNachos on 5/15/2011 @ 7:41pm POOP! by fredo on 5/15/2011 @ 7:47pm It would be interesting to see a slideshow or an array of thumbnails showing the billboards Clear Channel is offering to "give up" I'll bet none of them are the huge signs mounted on free standing pylons, but rather just some rusty little nondescript boards that no one ever rents. by cisserosmiley on 5/15/2011 @ 9:13pm one billboard that clear channel is "giving up" is this little teenie one on top of the building at 26th n proctor a little towards the met. it is small and since it is on a building it is not very visible compared to the big pole sitters on 6th ave.
by NineInchNachos on 5/15/2011 @ 10:50pm Turn out! Who wants to come speak out in support of the people? by Nick on 5/16/2011 @ 9:23am Let's also not forget that the City should have no reason to believe Clear Channel will honor any agreement, based on past performance. In fact, we can see that Clear Channel has willfully ignored city ordinances in the past. I think this should be weighed in with *any* future agreement with Clear Channel. by NineInchNachos on 5/16/2011 @ 9:28am Come on Weekly Volcano, Cancel your 'in on the party' billboards and stand with the people ! Now it is the time for the Council to do the right thing and follow the advice of Tacoma residents & the Planning Commission for the betterment of the city and ban digital billboards!